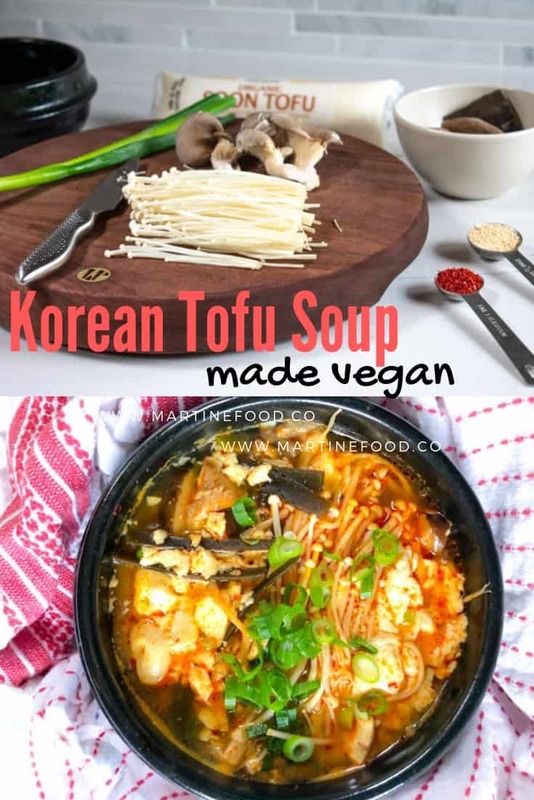 Eat vegan Korean soft tofu soup straight from the pot or spoon into smaller bowls. This post contains affiliate links. Please refer to the disclosures for further details. 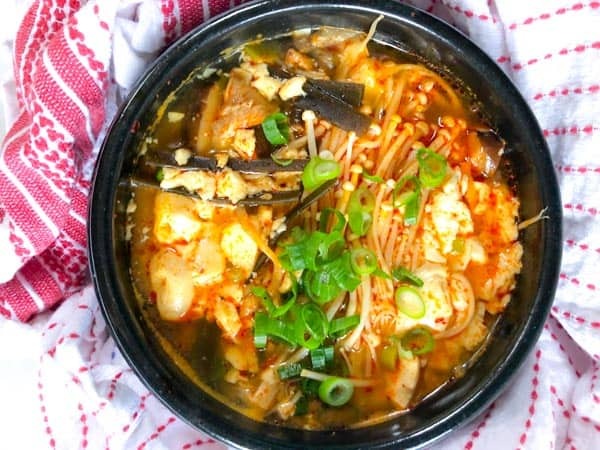 It may seem like you need a lot of ingredients for tofu soup, but all you really need to have is the soft tofu and Korean red chili flakes. The remaining ingredients can be added to your liking. Whether you add vegetables, beef, or seafood, you must have these two ingredients. The remaining ingredients are interchangeable to suit your omnivore taste. This is different than silken tofu that comes in a plastic carton. This tofu is specific to this soup and comes in a squeezable plastic tube. The texture is much softer and creamier than silken tofu in a carton. 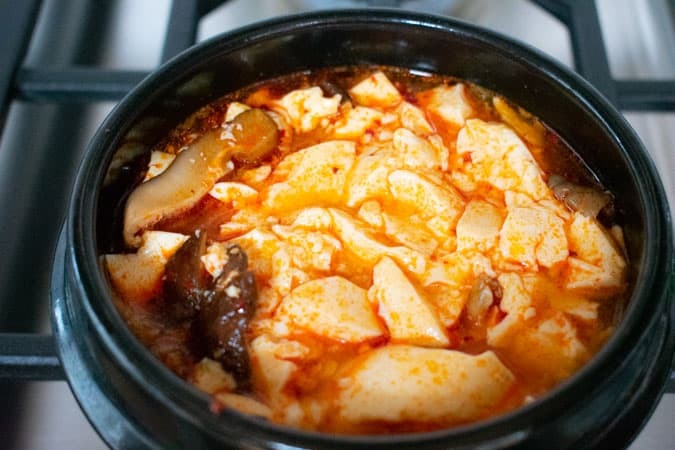 It breaks up into small curds without disintegrating and gives Korean soft tofu soup its characteristic creamy texture. This comes in coarse and powder form. Either will work, though some will say that coarse chili flakes have better flavor. This also must be frozen if you do not use it within a month or two, or else the color will oxidize and turn brown. Should you use Gochujang Red Pepper paste? Some online recipes use gochujang, or a korean red pepper paste, to obtain the red color and flavor. 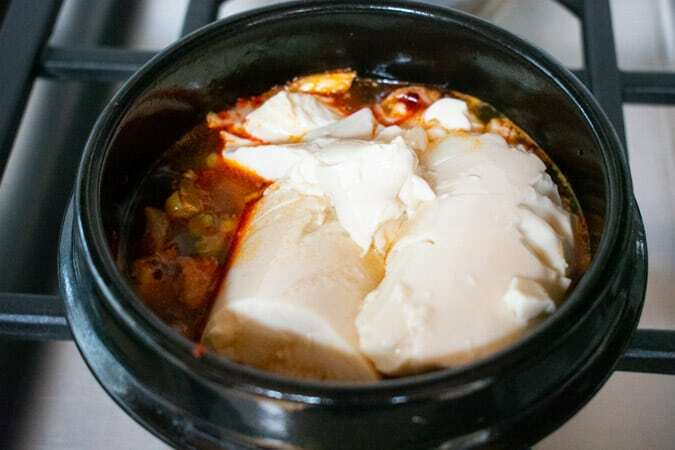 In addition to Korean red chili flakes, it has rice flour, fermented soybean powder, and salt. However, I did not see this ingredient in any of the traditional Korean cookbooks I studied. Instead, they used the chili flakes, so this recipe does too. 2) You’re not a witch. Why is it always served in a mini black cauldron? It’s actually called a ttukbaegi that originated in the Goryeo dynasty during the early 10th century. The mini black cauldron keeps it the bubbly boil going, so it’s hot enough to cook a raw egg and remain warm enough until you finish the soup. Since there is no egg in this vegan version, a simple pot will work that can be spooned into a soup bowl to serve. Pour boiling vegetable stock over the kombu seaweed. Set aside for a few minutes for the kombu to rehydrate. This gives the tofu soup a little sea flavor, since no seafood is being added. 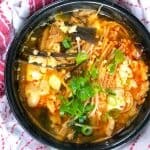 There is some debate whether the Korean chili flakes should be sauteed in oil first or just added to the soup with everything else. It is sauteed in this recipe first just to get the release of red color started. This step is like paying your bills online. Some do and some don’t. I prefer doing this to bloom the chili flakes and get them all toasty and warm. They need a bit of coaxing and cajoling (ie stirring) to release all their red dye potential. Other recipes will just sprinkle it in with everything else and that does work too. 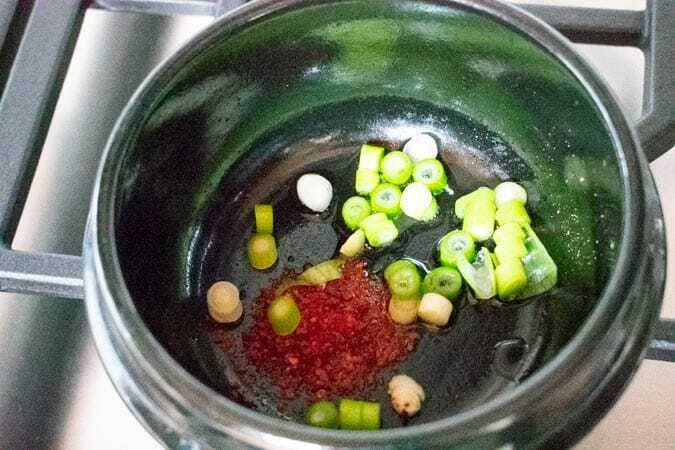 It just takes a few minutes to get all the red color of those chili flakes, so I stir it with the oil and green onion (white part only) in the beginning instead. 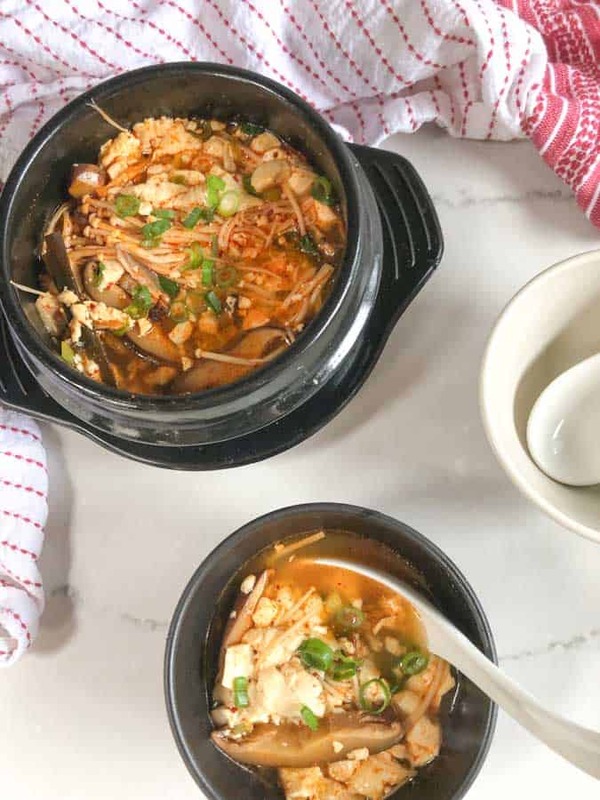 Oyster mushrooms are featured in this soup for its silky, soft texture that matches the soft tofu. Add oyster mushrooms to party. Stir them in a little bit to get a teeny bit of caramelization to deepen their flavor before the addition of liquid. Oyster mushrooms are much softer and silkier than button mushrooms. Use those if you can’t find oyster mushrooms. It feels like mushrooms are often the default vegan meat alternative, doesn’t it? 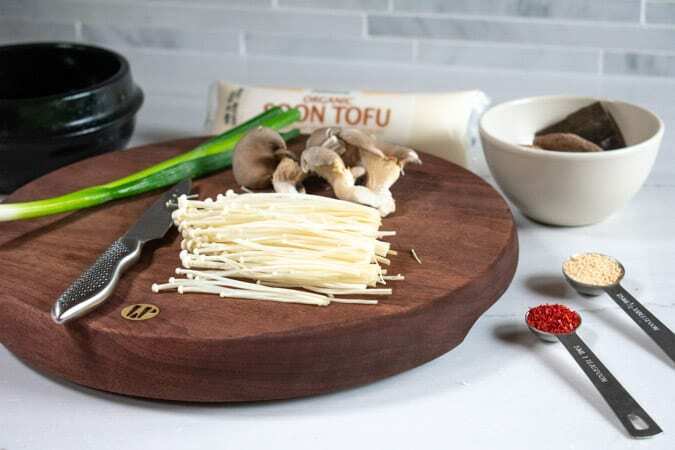 This recipe is no different, apologetically or not, but oysters mushrooms do match the texture of silky tofu quite well. The creamy tofu that comes in tube comes out like a big white blob. Gently breaking it up with a spoon is actually kind of fun. Add the vegetable/kombu stock, squeeze the tofu out of the tube, and bring to a boil. This is single serving, so it shouldn’t take long. It should just be enough time to pull the cork off that weeknight bottle of wine, pour, and sip. Those enoki mushrooms on top aren’t quite cooked yet. Just a few more seconds in the hot soup, and they’ll be limp enough to eat. How will you know? They go from stiff and standing straight up to limp and parabolic, which in this situation is desirable. I had debated whether dried shitake mushrooms should go in this dish (pictured on the left of the soup bowl). However, even after rehydrating, they remained chewy and a bit of an unpleasant contrast with a soup that’s mostly slurpable. If you can’t be bothered with all the above steps, you can just dump everything in a pot, bring to a boil, and eat. It will taste similar but perhaps feel medieval. You can also just boil all the ingredients together if you don’t want to be bothered with all this sauteeing and added ingredients gradually to your bubbling cauldron. Totally understand. We could all use something hot and creamy in our lives, and this one happens to be vegan too. Please, please like or share if you enjoyed this post. 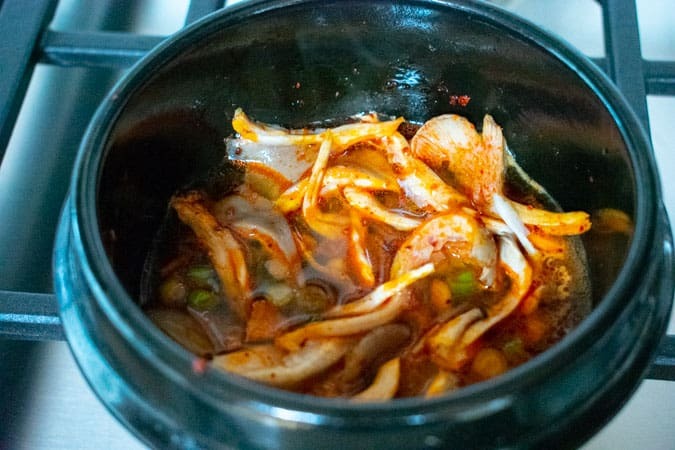 You won't miss the meat in this vegan Korean soft tofu soup recipe, aka soondubu jigae. The addition of silken mushrooms and richly flavored broth in this warm, cozy, and creamy soup. Heat vegetable stock to a boil. Pour over kombu and set aside to allow the kombu to rehydrate for about 5 minutes. Slice the kombu for garnish if desired. Heat saucepan over medium heat. Add oil, Korean chili flakes, and white part of the green onion. Stir for about 30 seconds to allow the onion to cook and chili flakes to bloom. Add the oyster mushrooms and stir for 30 seconds longer. Add the vegetable/kombu stock, tofu, mushroom seasoning to the pot. Bring to a simmer, and cook for 3-4 minutes until tofu is heated through. Stir to break up the tofu. 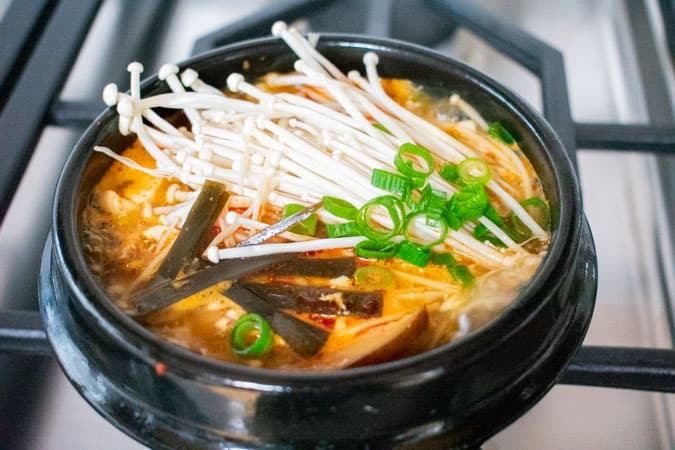 Add enoki mushrooms and sliced kombu on top, and simmer for another 30 seconds to a minute until enoki mushrooms are heated through. Garnish with remaining chopped green onion. If you can't be bothered with all the above steps, you can just dump everything in a pot, bring to a boil, and eat. P.S.Do you love vegan soups and stews? Please spread the Asian ♥ and share!